I freaking LOVED this book. I loved every minute of it. I absorbed and devoured every page. Okay, okay, now that I've gotten that out of my system, I'll break it down a little bit better for you! 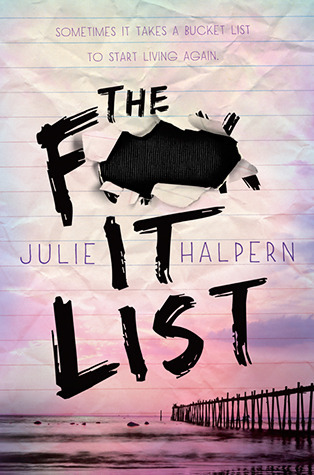 Julie Halpern sure knows how to pen a heart-wrenching yet hysterical novel. Even in the very core of a Cancer diagnoses the puns and one liners keep coming that you can't help but laugh through your tears. I absolutely adored Becca. And even though it was very early on in the book, the bedroom scene with the neighbour still gets me giggling. That scene will forever stay in my mind when I think about this book! Alex was a great character as well! There were moments I found her a little too angsty(is that a word?) at times but that was easily overcome by her witty personality and sense of humour. If you're not a fan of heavy storylines don't let this book slip by you. Yes, it has a heavy subject matter, but the book has a lovely delivery to it. Like I mentioned before, a great lightness to it. I loved everything about this novel; From the writing style to the beautifully crafted characters! I would love to read this one. When I was a teenager, one of my closest friends died of cancer. It's a horrible thing to go through. I've found that, often YA novels deal with the subjects like cancer far more realistically and honestly than many books for adults. A Summer to Die by Lois Lowry is well worth reading as well, though it is a little dated.